Behind a non-descript building in suburban Minneapolis, several Yoga participants are seeing an eerie likeness of a Yogi doing the tree pose on the peeling bark of a 50-foot pine tree. Though there is some dispute who the likeness is of, there is no disputing that the image is that of a person doing a Yoga pose. The image is fueling speculation and wonder in the insular world of Yoga practitioners. There is a belief that somehow a great Yoga spirit is looking down and protecting this area of Minnesota. John Schuster, who has spent more than 30 years at the helm of the Okie-Dokie Yoga studio, first spotted the likeness when he decided to do some yoga poses in the outdoors. 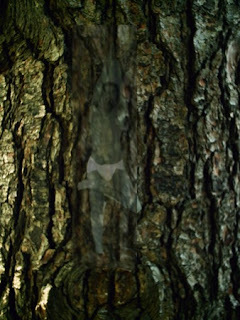 “I decided I wanted to do a tree pose out by that tree and was flipped out when I focused my dristi (a Yoga focal point) on the bark of the tree when I suddenly noticed a figure doing the tree pose on the tree.” He added, “It was kind of spooky to be doing a tree, while seeing a tree on a tree”. 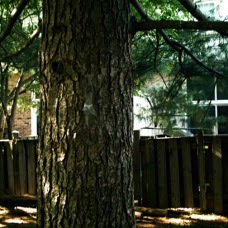 Though Mr. Schuster claims the figure on the tree looks like BKS Iyengar (a famous Yoga Star), others aren’t so sure. Brenda Stephens, a 27-year-old “Yoga assistant” at the studio thinks it looks like Shiva Rae (another Yoga Star), while Jenni-Ji, a student swears it looks like Rodney Yee (another Yoga Star). Even non-yogi Hari Houdini claims to see the figure, but he said it looks more like Ronald McDonald. The tree is guarded by a barricade with a single candle, Om symbols and copy of two famous Yoga tomes, “My Third Eye Itches” and “Right On Yoga”. They have been placed by well-wishers who practice nearby. Mr. Schuster commented, “I guess when it starts talking, then we will really be freaked out." For any new Yoga teacher (or those wanting to advance their teaching skills), it is important that you master one of the most crucial aspects of Yoga which is not usually covered in conventional teacher training courses; the Art of Yoga BS. Critical to your success as a Yoga teacher in today’s competitive and crowded Yoga scene, it is important that you master this principal skill so that you will become a successful and prosperous Yoga teacher. Offered through the YogaDawg College of Yoga, this training offers a solid grounding in Yoga BS. YogaDawg’s BS for Yoga Teachers will teach you how to BS in any Yoga class with no knowledge of the subject or the need to study ancient Yoga texts. “The recognition of the three worlds while resting in Child’s pose leads us to realize ourselves; and all life; as of the Soul of Yoga. As we dwell, not in past, present or future, but in the Eternal, we become more at one with Yoga." “The whole outer world exists for the purposes of Yoga and finds in this, its true reason for being a Yogi. Shopping at the GreatTranscendentalYoga Superstore encompasses the grades or layers of the Three Potencies of Yoga. Yoga stuff then becomes Defined, Un-Defined or On Sale. So always look for that with distinctive marks known as logos; finding these on sale are even better”. Never again be thrown or rendered speechless when one of your students has the audacity to ask something like, “What exactly did Pantanjli mean in Chapter 1, Sutra 2 of the Yoga Sutras when he wrote, "Yogas citta vrtti norodhah"? Be assured that you will now be able to answer such questions with confidence and cunning wisdom. By enrolling in the YogaDawg BS for Yoga Teachers, you will be offered bold techniques such as the patented NTNF (Not true, not false) Technique. This technique will perfect you in the practice of asserting whatever the student knows to be true, is false (or false, is true). With the contention that the ancient Yogis didn’t know as much as the current American Yoga Stars (and backed by the authoritative Yoga resource, Yoga Journal), you will have those neurotic students who ask such questions, believing that you are the source of a new trendy Yoga philosophical approach. So, enroll today at YogaDawg’s College of Yoga (classrooms in most major Yoga studios world wide) and save 50% during this one-day sale. In an amazing testimony to the popularity of Yoga in the last few years, the Clearinghouse for Yoga Business (CYB) has confirmed that there are now more Yoga studios then Starbuck outlets. What started as a whim by some hippies standing on their heads as they tried to follow the Yoga teaching of the great Masters of India, has now turned into an American craze that has surprised even the most vocal of Yoga advocates. "I knew Yoga was popular, but I had no idea just how so!" remarked Sundas Kuwasana of the US Yoga Advocacy. "Even we were caught off-guard by this report", he added. Jim Donald, Starbucks president and chief executive officer, confirmed the findings of CYB but appeared undaunted as he joked to this reporter, "Yes, we were asleep at the switch. Too much decaf I suppose. ", Mr. Donald commented. 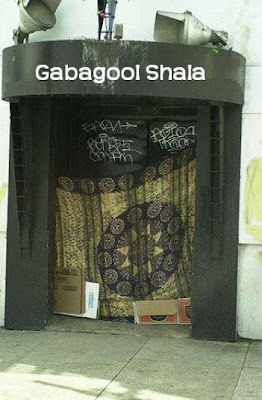 He added, though on a more serious note, "We are currently in talks with the NivanaPranaWorldYoga SuperStudios to place Starbuck cafes in all 2,369 of their studios. This should keep us ahead of the Yoga trend". Sources close to Starbucks confirmed that the slogan for this new strategic partnership will be "Kick your relaxation to the next level". An estimated 240 million Yoga mats are discarded each year, adding to the estimated two to three billion now littering the landscape. Yoga mats are ideal breeding grounds for rats and mosquitoes and are fire hazards (burning, they release toxic chemicals into the air and produce an oil-like residue that can contaminate groundwater). Environmental Concerns. 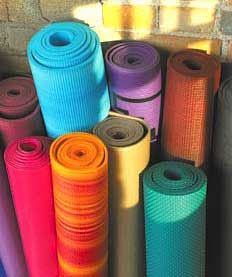 The Yoga mat industry's environmental efforts have focused primarily on the reuse, recycling, and safe disposal of scrap mats. Reuse programs include retreading as well as newer anti-erosion programs. Recycled mats can also been used in asphalt-based road coverings, shoes, household items, and even new mats. But in spite of all these programs, hundreds of millions of mat discards went to landfills since the beginning of the Yoga boom in the early 2000. 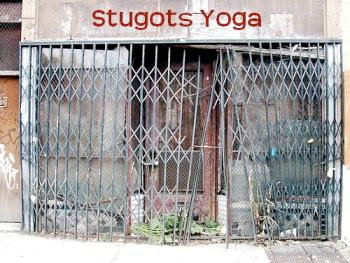 Ms. Sally Hartgield, Press Secretary for the Yoga Mat Association, summed it up this way, "What a mess"! In what appears as a celebrity world going mad (or at least bald), Tom Cruise is the latest star to shave his head (see Britney Does YogaDawg). Appearing on the NBC's Today Show, Cruise explained why he shaved his head to Matt Lauer. 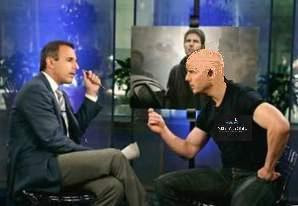 Mr. Cruise was asked if shaving his head might hurt his chances of landing future movie deals. He replied, “No! As a matter of fact, I am in talks with the producer of the “The One True Yoga” (see The One True Yoga) to play in the sequel The One True Yoga II as the Court Jester”. When the non-profit YogaDawg Foundation was contacted for this story, they at first were quite stunned that Tom Cruise had somehow gotten a hold of a YogaDawg t-shirt (see Qualifications for Purchasing YogaDawg Gear). MadDawg, the handsome husband of HotDawg (formally Born and Maiden America, the two disciples of YogaDawg) declared that the shirt Tom was wearing was in fact, fake. “We had NBC send us close-up of the shirt and saw that it is clearly a fake. We feel bad for Tom, but we still won’t sell him a t-shirt”, MadDawg said. HotDawg added, “But you know, he is kind of cute, especially with all that jumping up and down he does. He kind of looks like he’s doing Ashtanga Yoga sometimes. I think he can become a great Yogi if he ever decides to become a disciple of YogaDawg”! Federal prosecutors filed a lawsuit yesterday seeking to seize control of several Yoga studios in Chicago, declaring that they are dominated by the Mafia. Expanding the use of Federal racketeering laws, the civil suit asked a Federal court to appoint supervisors to oversee the operations of the busy yoga studios and its main union, The United Yoga Workers Local 459 of the A.F.Y.L (American Federation of Yoga Laborers). The prosecutors, asserting that yoga class prices were being driven up by racketeering, the suit described both the studios and the union as "captive" organizations of the Om Capone yoga crime family. "The Government has filed a racketeering suit to put the Yoga studios under court supervision", said Patrick J. Fitzgerald, the United States Attorney in Chicago. At a news conference to announce the suit, Mayor Daly said he had initiated the investigation three years ago when a friend who operates a yoga studio told him of being required to make payoffs to “shady characters wearing high-end Yoga clothing and gold Om necklaces”. 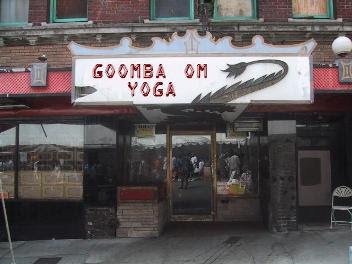 Much of this activity has been centered around three studios in particular; the Stugots Yoga Studio, the Gabagool Shala and Goomba Om Yoga Studio. Asked how it came to be that the mafia targeted yoga, the mayor replied, “Yoga is a multi-billion dollar industry. Seeing a drying up of gambling "revenue" due to the new family friendly atmosphere of Chicago as well the lose of drug ‘revenues” from the gentrification of major parts of Chicago, the Om Capones decided to target the lucrative yoga market”. The mayor clarified, "It's like when Jessie James was asked why he robbed banks and his reply was,'that’s where the money is', well so it appears with yoga”.